When I cut white Quartz and white Topaz, they look identical. In fact, when both are faceted using the exact same pattern, it’s impossible to tell the difference just by looking at them. Several of our customers have pointed this out and have asked “What makes them different?” The answer is rather technical. The shape of the Quartz and Topaz crystals are very different. All types of Quartz crystals grow in a Trigonal and Hexagonal geometric shape, while all forms of Topaz grow in an Orthorhombic geometric shape. This shape, in and of itself, doesn’t really affect my gem cutting. All varieties of Quartz (Amethyst, Citrine, Ametrine, Smoky, Rose, etc.) have a hardness of 7 on the Mohs Scale. All varieties of Topaz (London Blue, Swiss Blue, Sky Blue, Imperial, etc.) have a hardness of 8. That means that Topaz will scratch Quartz, but Quartz will not scratch Topaz. If we get the gems mixed up, we can scratch one of the gemstones with the other and whichever one is scratched will be Quartz. Naturally this will ruin the Quartz so it’s not the best test. Given the hardness of both gems, they are very suitable for all types of jewelry. If you’re into chemistry, the chemical composition for Topaz is Aluminum Silicate (Al2SiO4 (F, OH)2) and Quartz is Silicon Dioxide, SiO2. The density of Topaz is 3.49 which is higher than Quartz at 2.65. This means that Topaz is about 25% heavier than Quartz. If you were to hold a Topaz crystal in one hand and the same size Quartz crystal in the other, you would easily be able to tell which one is Topaz. We experience the same thing when we weigh individual gems. Identically cut 8mm Topaz and Quartz gemstones illustrate the same point. We have several of each in our collection and the 8mm Topaz weighs an average of 2.2 carats while the 8mm Quartz weigh an average of 1.6 carats. Weight is the fastest way to differentiate the two. Quite simply, Quartz does not fluoresce. Topaz on the other hand, typically shows a weak fluorescence. The fluorescent color will depend on the color of the Topaz. As an example, white and blue Topaz may fluoresce yellow or greenish whereas brown, yellow and pink Topaz may show a strong orange-yellow glow. According to Wikipedia, Cleavage, in minerology, “is the tendency of crystalline materials to split along definite crystallographic structural planes. These planes of relative weakness are a result of the regular locations of atoms and ions in the crystal, which create smooth repeating surfaces that are visible both in the microscope and to the naked eye”. That’s a mouthful! All gemstone crystals have been assigned a Cleavage rating which ranges from “Perfect” to “None” or “Indistinct”. This is probably as clear as mud so we’ll naturally we’ll use Topaz and Quartz as an example. Topaz has a Perfect Cleavage, which means that when Topaz breaks, the pieces will tend to have flat edges. Quartz on the other hand has a Cleavage rating of None, which means that when Quartz breaks, it looks like shattered glass. This is actually very important to a Gem Cutter. Quartz can be faceted (cut) from any angle or position and the result will be unaffected. You’ll get a nice gem. However, given the Perfect Cleavage of Topaz, it is necessary to cut the crystal so that the Table (the top flat surface of a gem) is 7 to 11 degrees off from the main axis of the Topaz crystal. With a complete Topaz crystal (all the edges intact) this process is very easy. If Cleavage is not taken into consideration, the Table on a Topaz gem will be very difficult, if not impossible, to polish flat. This is probably the most complex characteristic in mineralogy and there are differences between Topaz and Quartz. Reflective Index is a measurement of the angle at which light enters the gem and subsequently bends due to its molecular structure. When the light is bent, it typically divides into the colors of the rainbow. To illustrate, some of you may remember using a Prism in your early Science classes. A single beam of light aimed at a Prism will cause a rainbow of color coming out the other side. This same phenomenon occurs in gemstones and is perhaps the most important characteristic for Gem Cutters. Each type of gemstone will have the same, or very similar, Refractive Index. As an example, the Reflective Index for all varieties of Quartz ranges from 1.544 to 1.553 while the Refractive Index for all types of Topaz ranges from 1.609 to 1.643. How we use this information becomes rather complicated. The sparkle of a gem is caused by light entering the surface of the gem and reflecting off the bottom. The Reflective Index helps us determine which angles to cut to obtain the most sparkle from different types of gemstones. Worded differently, if we use the correct angles on the bottom portion of the gem (called the “Pavilion”), light will reflect back out the top of the gem to give us lots of sparkle. Conversely, if we use the wrong angles on the bottom of the gem, the gem will appear dull. From the Reflective Index, we know that the light entering a Quartz gem will be bent at slightly different angles than the light entering a Topaz gem. 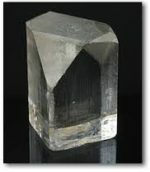 Therefore, the angle of the facets on the bottom of a Quartz gem should be cut differently than the angles of the facets on the bottom of a Topaz gem. This is actually an over simplification, because the angles on the top of a gem (called the “Crown”) as well as the thickness of the outer edge of a gem (called the “Girdle”) must also be taken into consideration. For us old folks, light entering a gemstone is like watching the old game of Pong. Most Jewelers purchase a Refractive Index Meter which calculates the Refractive Index for a particular gem and are therefore able to determine the identity of a gem most of the time. This is probably the best tool to use to differential one gem from another, and certainly Topaz versus Quartz. I congratulate those of you who have read this entire article. You have just completed a basic course in Gemology.